The bodies of the 23 Bangladeshis, who were killed in US-Bangla plane crash in Nepal, were handed over to the families on Monday afternoon. A cargo plane of Bangladesh Air Force, carrying the bodies, landed at the Hazrat Shahjalal International Airport in the city at around 4:05 pm. Road Transport and Bridges Minister Obaidul Quader and Civil Aviation and Tourism Minister Shajahan Kamal received the bodies t at the airport. 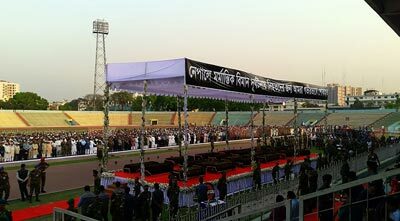 The 2nd namaz-e-janaza of the plane crash victims was held at Army Stadium. Earlier, the first namaz-e-janaza was held at Bangladesh Mission in Kathmandu at 9am on Monday. At least 51 people were killed as flight BS211 of US-Bangla Airlines burst into flames at the Kathmandu airport in Nepal on March 12. The deadly crash claimed lives of 26 Bangladeshis, 22 Nepalese, and a Chinese. Out of 26, 23 bodies have already been identified. The rest 3 are under process to be identified.